This year, PD has looked a little differently in my school board than it has in the past. I had the opportunity to experience a "collaborative inquiry" for literacy that was specific to French Immersion students (and their teachers). There were multiple foci, it seemed, but one recurring idea that was deeply entrenched in the format of the collaborative planning and teaching cycle was that of teaching in a responsive way. I expect I'll be dipping into the well of things I learned through that more than once and sharing some thoughts here. I never feel great about flying by the seat of my pants, even if I don't work from a script, so I had an idea to make myself more comfortable. A folder of tools that I can rely on for switching gears in the middle of a lesson if things aren't going exactly as anticipated makes me feel a lot more effective as an educator. Sure, I know lots of instructional strategies and can differentiate my lessons in a number of ways, but somehow, knowing I've got a few tricks already photocopied and ready to use at my finger tips helps me to feel more prepared and professional. I call it my "Responsive Teaching Folder" and it sits within a magazine holder, right next to the one for Emergency Supply Lessons. Of course, there are a ton of other strategies I use (think-pair-share, and thumb temperature checks come to mind right away) that just aren't going to go into a folder as a photocopied paper. 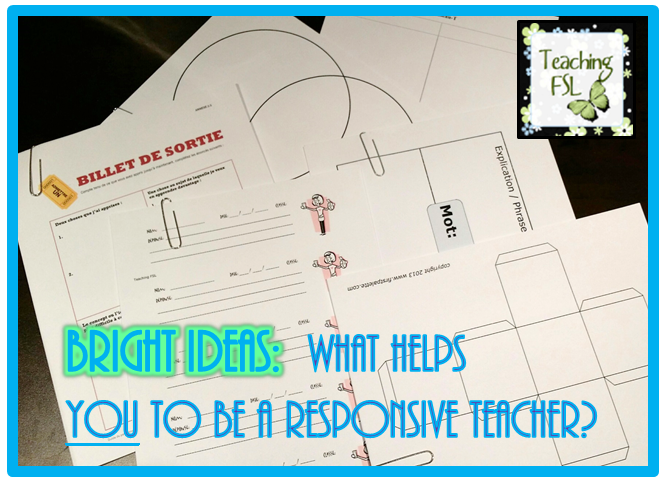 However the Responsive Teaching Folder just reminds me that I already DO use these strategies, and am accustomed to switching gears mid-lesson when my learners clearly need that change. I'd love for you to leave me a comment below if you have other ideas for things to include in my classroom folder. 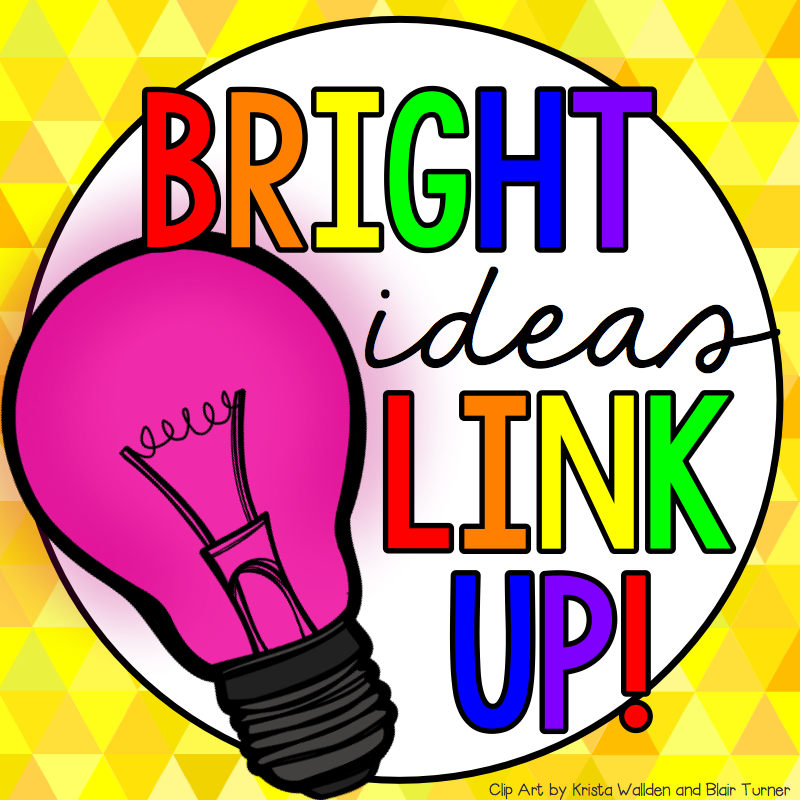 Be sure to visit some of the other Bright Ideas blog articles in this month's link up as well. Great idea Tammy! I know I like to plan things out and sometimes we have learned so many different strategies and things to do that we forget some of them sometimes. It would be great to be reminded of them by having them collected in a folder. Thanks! It's true... we sometimes have to reminded of what we forgot we knew. Especially when it's so busy in the classroom. 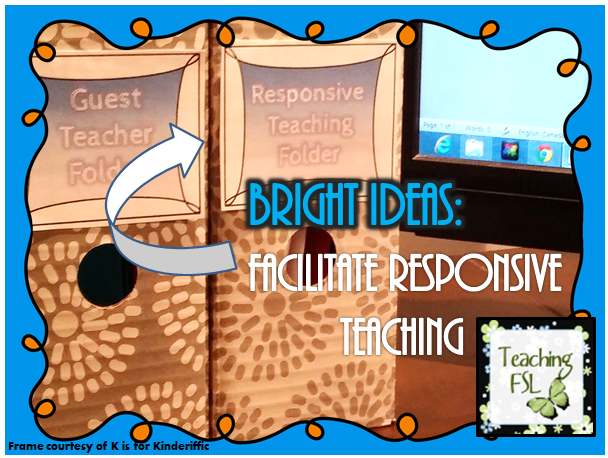 Love this idea of everything in a folder ready to go...I'd say this is a must-have for any teacher. Thanks!